Vanita Gupta has spent most of her professional career as a civil rights advocate, first as a lawyer with the NAACP Legal Defense and Educational Fund and then with the American Civil Liberties Union. From 2014 until 2017, Gupta was a United States Assistant Attorney General for the civil rights division of the U.S. Department of Justice. In this role, she spearheaded criminal justice reform and presided over the investigations into police departments following the unrest in Baltimore and Ferguson, Missouri, after the deaths of Freddie Gray and Michael Brown. Now, Gupta is the president and CEO of the Leadership Conference on Civil and Human Rights, taking over the mantle from Wade Henderson, who retired this year after leading the organization for more than two decades. Founded in 1950, the 67-year-old organization headquartered in Washington, D.C., adheres to a multi-issue civil rights platform that addresses a wide range of issues, including immigration, voting rights, LGBTQ rights and improving access to educational opportunities for historically disenfranchised groups. “I think having Vanita in this new role as president is a reflection of our values as an organization, and we’re very proud of the fact that she has taken over,” says Henderson, who is now the Joseph L. Rauh Chair of Public Interest Law at the David A. Clarke School of Law at University of the District of Columbia. “There have been only men on the job. I think having a woman, having a child of immigrants is a reflection of the broadening of the civil rights mandate and the way in which organizations like the Leadership Conference have helped to make that happen,” says Henderson. 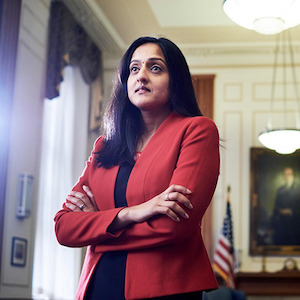 Gupta, a graduate of Yale University and New York University Law School, grew up in Philadelphia, Pennsylvania, and is the first in her family to become a lawyer. She says that her dedication to civil rights work comes from a place of passion as well as personal experience. “I grew up kind of excited and engaged with world events,” says Gupta. An early encounter with racism reinforced her desire to become a staunch diversity advocate. She recalls being only four years old when a simple trip to a McDonald’s restaurant would become “a memory that is seared into my brain,” she says. At the time, her family had just moved to England, shortly after Margaret Thatcher had been elected prime minister. Thatcher’s “populist-oriented election” gave birth to the rise of the skinhead movement across England, Gupta says. Gupta says that her experience with racism mirrors the experiences of many minorities across the country and the world. “It’s hard to sit silently by and see people, vulnerable folks, dealing with injustice and not wanting to do something about it,” she says. In the aftermath of violent protests that were sparked by multiple police killings of unarmed Black men, Gupta crisscrossed the nation to engage directly with angry citizens living in urban centers. “It was just significant to have the Justice Department give voice to all of that and to validate those experiences, but to do so with the statistical analysis behind it, with the ability to have spoken to hundreds and hundreds of people of a particular community or to speak to hundreds of police officers, as well,” says Gupta. Under her leadership, the Leadership Conference on Civil and Human Rights is actively taking on the Secretary of Education, Betsy Devos, and U.S. Attorney General Jeff Sessions. She says that she has concerns about transgender student rights, after the Trump administration made news by revoking President Barack Obama’s guidance for transgender students. In addition to protecting the rights of transgender students, Gupta says it’s important that immigrant students’ access to educational resources be protected, regardless of their citizenship status and that school discipline issues that cause more students of color to be funneled through the alternative school system and criminal juvenile justice system be addressed. She says that there are no shortage of issues. This story also appears in the July 27, 2017 print edition of Diverse.